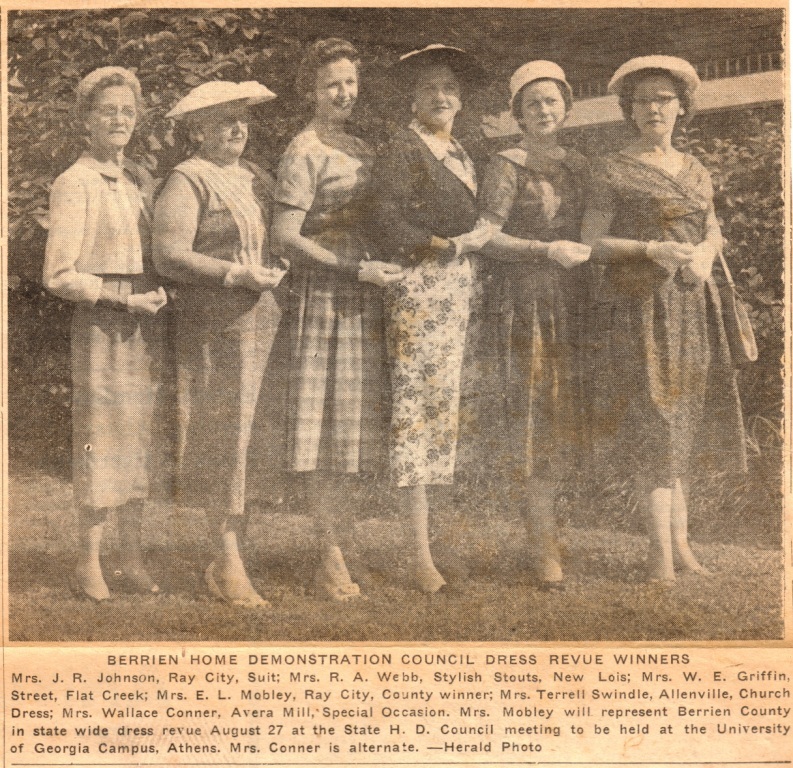 An old newspaper clipping covered Ray City women modeling the latest fashions. Mrs. J. R. Johnson, Ray City, Suit; Mrs. R. A. Webb, Stylish Stouts, New Lois; Mrs. W. E. Griffin, Street, Flat Creek; Mrs. E. L. Mobley, Ray City, County winner; Mrs. Terrell Swindle, Allenville, Church Dress; Mrs. Wallace Conner, Avera Mill, Special Occasion. Mrs. Mobley will represent Berrien County in state wide dress revue August 27 at the State H. D. Council meeting to be held at the University of Georgia Campus, Athens. Mrs. Conner is alternate. Mrs. R. A. Webb = Pearlie Ann Register, daughter of Marion Register and Elizabeth L. Parrish Register, and a granddaughter of Ansel Parrish and Molcy Knight. She and her husband, James Alford Webb, lived many years in Ray City and Berrien County. Mrs. Wallace Conner = Bonnie Lewis, daughter of J. Lonnie Lewis and Mittylene Phillips Lewis. Her husband, Wallace Donald Conner, was the last miller to operate Avera Mill. He was a son of Ray City residents James Wilson Lewis and Pearlie Sutton Conner.